I am writing this article while the temperature is in the single digits outside. The conversation at work will be all about the weather. The media had predicted the storm of the century over the weekend, and the roads were going to be a skating rink. As a result, many people cancelled their plans because the impending forecast scared them all. Yet, all we got was a heavy rain, which, had it been snow, would have been over a foot. The weekend weather projections are typical of today’s society, seeing the negative and never praising the positive. Well, I would like to take the opportunity to talk about the good. We just had a very busy weekend at ENJC. After the Friday night service, a group of about 25 congregants participated in our annual Tu B’Shevat Seder. The Seder has been a Brecher tradition, with even my daughter, Amanda attending, except in the years that she was away at college. It was an enjoyable evening, led by Rabbi Silverman and Cantor Cohen, with a feast of fruits, nuts and grape juice, and the very special muffins made by Carolyn Gilbert. Thank you to Wendy and Ed Isaac for shopping and setting up the Seder. I would like to give a special Thank You to Carolyn for not only making her special muffins, but the significant time that she has spent cooking and helping out during Religious School. I know that the children have been enjoying her tasteful treats. The highlight of the weekend was the outstanding job done by David Kessler for his Bar Mitzvah. 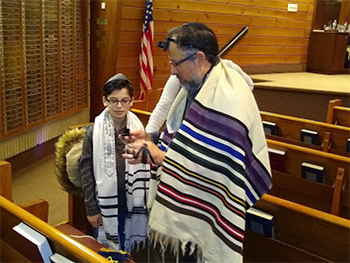 David wonderfully executed his Haftorah, which, according to Rabbi, is the “mother of all Haftorahs,” chanting swiftly and easily, to perfection, in front of a turnout of in excess of 110 congregants, family and friends. 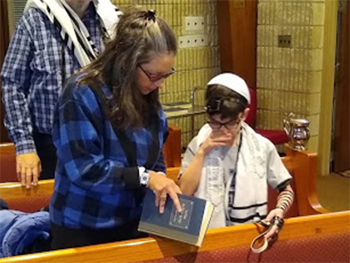 David and his family spoke very highly of his Bar Mitzvah tutoring by Lisa Maron. 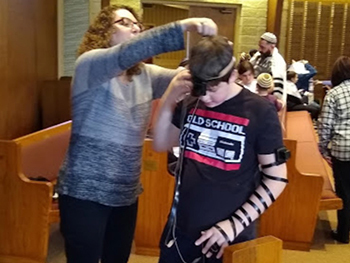 David is the fourth student trained by Lisa, but the first Bar Mitzvah to work exclusively with Lisa, the other three having started with other tutors. We are looking forward to the next six students who have been working with Lisa. Now that the winter holiday season is behind us, the nights are busy at the shul. Successful events never happen unless properly planned. Of late there been meetings to discuss this year’s Purim Event. Please mark your calendar for the evening of March 20th. Details to follow in the ENJC weekly and the March bulletin. The Security Team has been meeting to discuss our game plan to prioritize the use of money from the grant we received toward the areas of greatest need. The Financial Team is analyzing our operating costs so that we can operate efficiently and not eliminate anything that makes ENJC the shul that I am proud to represent. Remember that you, the congregants, are the ones to make a difference. 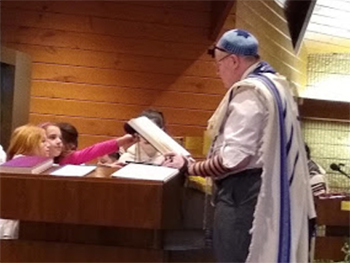 Please help support the daily minyan! Besides the five congregants saying Kaddish, Rabbi will be saying Kaddish for his Mom. We can always use your help at 8:15 Sunday through Thursday night. Hopefully, when you read this, the Groundhog will not see his shadow and Spring will be coming soon. I will continue with my positive thoughts and not complain about the negatives in the world.